Awesome chart by Paul Kedrosky on the average per capita income levels of Detroit vs. San Francisco. 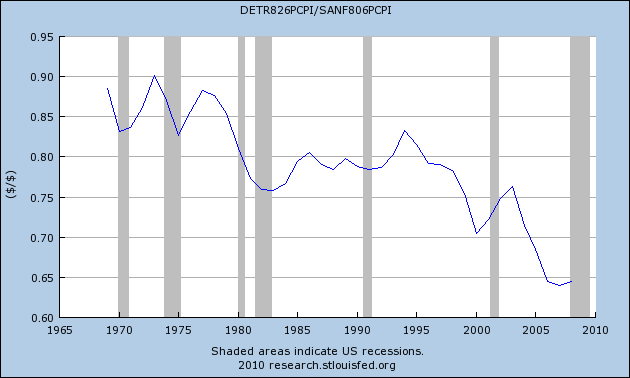 Basically, over the last 40 years Detroit's has gone from near income parity to 65% of what someone in San Francisco makes. There are lot's of reasons for this, but one intangible that I really believe in is the entrepreneurial incentive system in the Bay Area vs. Detroit. Update: Oops, I lost the second part of this post. Generally what I said is that startups (innovation) get acquired in the Bay Area or tap venture capital to build something even bigger. I'm not sure what Detroit is like today, but I remember a case study from my Kellogg Strategy class where the professor had charted mass engineer migration from Detroit to Silicon Valley in the 50's - 70's. It seems as though the car companies kept ripping off entrepreneurs and stealing their ideas vs. buying them and creating a healthy innovation ecosystem. The windshield wiper case of Robert Kearns was one case study my Kellogg professor used. The engineers got sick of it, and went west so they could make a living. Silicon Valley adopted the strategy of acquiring innovation, and 30 years later, you see the chart below.